Beer House Craft Man is easy and straight-forward to find. “Have you been to Beer House Craft Man?” was the first question I got asked by someone I got talking with in Bungalow. The craft beer scene in Kyoto is growing and it seems that the locals are happy to share the knowledge of it to anyone and everyone who is prepared to listen. “Make sure you get in the standing area at Beer House Craft Man” was the next piece of advice and off I went. Well, I finished my beers and off I went. The barman was the best dressed person in the bar. Besides the group of ladies wearing kimonos that came in around 8pm. 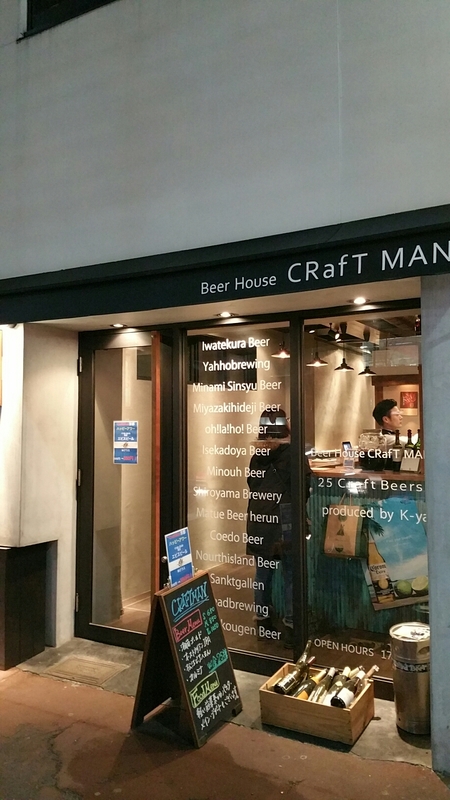 Beer House Craft Man is located on right around the corner from Shijo station, on the Karasuma line so it’s in a great location after walking around temples and castles. 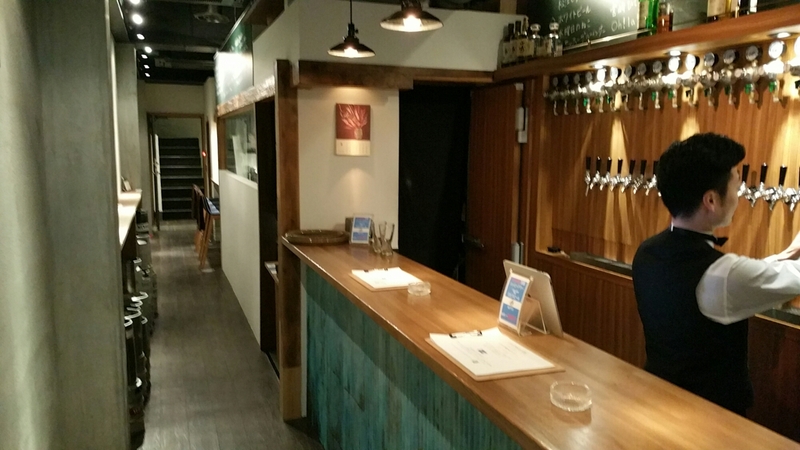 Moreover, it’s located in one of the bustling night time area of Kyoto, so once you have had some local food, you can then try some local craft beer. There are three main areas to Beer House Craft Man: the standing area at the front, a small counter section at the back of the first floor, and the two floors of seating upstairs. Stand here and pay no table charge. But you don’t get any food either. Sit down on ANY of the chairs, and you pay. There’s a catch though. Table charges and food. This is what I was warned about. The standing area has no table charge fee but then there is no food nor snacks. The counter section at the back gets you some kitchen action but also a table charge of ¥300. While going upstairs gets you some seats and a table charge of ¥500. We just wanted some beers so plumped for the standing section, as did six other people. The three beer set for 1,800 yen is good value but the beers are decided by the barman. So many beers, so many choices. The beer list Beer House Craft Man rotates as beers run out, which two of them did during our mini drinking session. The three-beer set came strongly recommended though the barman does decide the beers but at ¥1,800 for three 250ml glasses, it seemed like a safe bet. If you decide to go à la carte, then beers come in three sizes: small (250ml) at ¥650, medium (350ml) at ¥850 and large (450ml) at ¥1050. Some of the extra strength beers incur an extra fee of anywhere between ¥100 to ¥200 though all prices include tax and luckily for you, it’s a pay as you drink if you’re standing up. Ise Kadoya Brown Ale. A nutty, malty beer. Kinshachi IPA. Bitter and hoppy. Without much hesitation, we plumped for the three beer set as it seemed to be a good deal for the beers and having someone else decide the beer for us made it a logical idea. There was one problem, well two. The original selection was supposed to be Snow Blanche by Konishi Brewing, followed by Harvestmoon Brown Ale by Harvestmoon, then Kyoto Beer Alt. Those last two though blew and were changed over to the Ise Kadoya Brown Ale and then the Kinshachi IPA. Sarcasm isn’t conveyed well over the internet, but oh, how disappointed we were! The pours were ok, but the barman seemed to be intent on pouring, using a knife to scrape off some head, pour some more, scrape off some head, and repeat until happy. The atmosphere at Beer House Craft Man was weird. Even though the standing area was busy, the barman seemed to be quiet and didn’t engage in conversation until the rest of the customers were chatting away. A shame as he was very knowledgable about the craft beer market and industry of Japan. 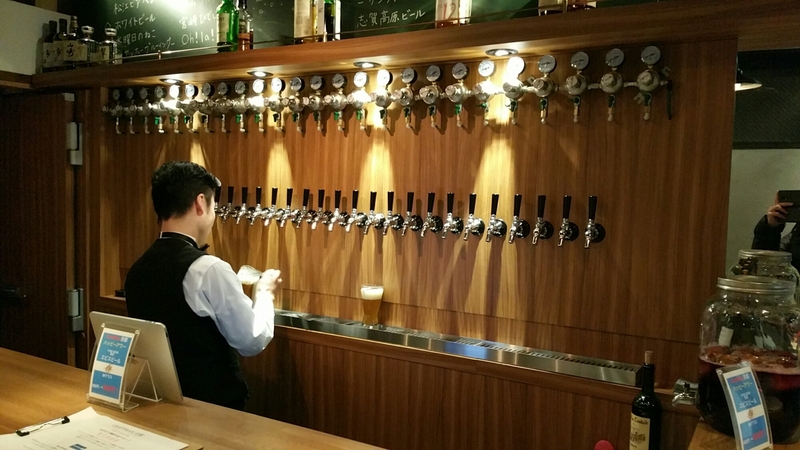 With the wide range of craft beers on tap, Beer House Craft Man is a great place to try lots of different ones from across Japan, though the confusing table charge rules and food/no food rules is strange. Even though it is pricier than other bars in Kyoto though the pay as you go drinking system enables you to keep track of your tab. The closest station to Beer House Craft Man is Shijo on the Karasuma line. It can also be reached from Karasuma station.